The course below is a sample two day video camera and audio training course. This is to give you some idea of the topics I could cover given two days. To be able to shoot a story I think you need to know how to shoot three basic elements: GVs (general views - the pretty pictures); sequences; and interviews or vox pops. So, most of my two-day courses are based around those elements. You also need to know how to focus, white balance and set exposure. Of course you need good audio too - so I cover the main types of microphones available, which ones to use and when, plugging in and setting levels. Then I add in exercises that meet your specific needs based upon your current abilities, the kit you will be using and the type of projects you'll be working on. Whether that's shooting for the web, observational docs, viral marketing campaigns, music or drama. You can see a full list of the core subjects I cover or am regularly asked about on courses. I also believe practice makes perfect - so all courses need plenty of hands-on practical sessions. You will be operating a camera in every session from practising how to manually white balance to setting up the camera and mics for an interview. Just wanted to say thanks again for last week - the training was excellent - just what I was looking for… and the catering was spot on too!" 'Just wanted to thank you for giving me such a full and useful two days. Filming at the weekend, I was constantly reminded of your advice and suggestions and, most importantly, I was aware of the confidence I have gained. The filming had its challenges (particularly the tripod) but I am happy with what I got. I am now keen to solidify this new knowledge and intend to film more. Thank you for getting me started." "Fantastic all round. Christina was great - very patient with us and happy to answer stupid questions. Content was very useful. I just wish I could have done the week long course. "Perfect length, I enjoyed having practical sessions where we tested the techniques we had learnt. Really good content tailored to our market. Christina is a very good tutor. She's good at tailoring the class to beginners and is very knowledgable. "Great course, well taught. Christina has fantastic enthusiasm and great patience with her students. Fantastic. I loved every minute. I can't wait to start practicing my new skills. "Actually the best course I have done! Superb teacher - delivered with wit and expertise. "Many thanks for the two day course that you delivered to myself and other members of the Kent Messenger Group last Thursday and Friday. Well designed and easy to follow tuition made for a very interesting two days. This was an excellent course, from which I learnt a great deal and now looking forward to the editing side of it all. "Very helpful. Learned lots. Should have done it years ago. I now feel immeasurably more confident." "Very good. Learnt an awful lot. Everything was well explained and Christina made sure we were taught at a pace that everyone was comfortable with." "The most useful was the advice on filming/composing shots. Selecting correct aperture/white balance etc . i.e. all the technical stuff. Ideas about constructing sequences were also useful - not only for our own camerawork but in working with crews in the future." "Informative in an easy to understand way. Not bogged down by technical jargon." HD, H.264, AVCHD, MXF, ---16:9, 1920X1080, 1280X720, 50Mbps, 35Mbps, 24p, 25p, 50i what the numbers and letters mean and why you need to choose carefully before you start shooting. Menus - setting up the camera. Making best use of the three legged beast. Push auto, Peaking and expanded focus - how the camera can help you focus acurately. Get confident with the camera and tripod. Discipline yourself to only get useful shots and not to hosepipe. Moving from one source of light to another. Shooting a simple sequence in which you can direct the action. Using Final Cut Pro, a chance to check whether some of the sequences you shot yesterday actually do cut together. Why the headphones are your best friend. …With cutaways to help the edit. Once again please note: your requirements may vary - this course outline is purely an example to show how much we can do in two days. This course would work for a group of 4-6 people. For a one-to-one session - we could probably fit in more. Editing on Adobe Premier Elements 11 and Final Cut Pro X. These are the most popular cameras. But, I can also do other cameras on request. 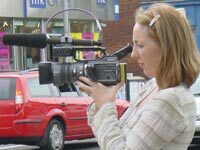 Check here for the other camera, audio and editing courses I provide. Still not found what you need. Then call me on 020 8621 3649 or email me.